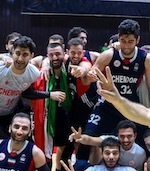 Newly promoted Chemidor Tehran (Superleague) landed experienced 36-year old former Iranian international point guard Mahdi Kamrani (181-78kg-82). He played most recently at Jilin Northeast Tigers in Chinese CBA league. In 20 games he averaged 11.9ppg, 4.7rpg, 4.1apg and 2.4spg in 2016-17 season. The previous (15-16) season Kamrani played at Fly Dragons (also in CBA) where in 34 games he had very impressive stats: 19.3ppg, 4.6rpg, 6.5apg and 2.8spg. He also represented Iran at the Asian Championships in Changsha-Hunan (China) three years ago. Kamrani's team won Bronze and his stats at that event were 9 games: 8.2ppg, 2.6rpg, 2.6apg, Steals-5 (2.0spg), FGP: 39.6%, 3PT: 28.1%, FT: 60.0%. Kamrani has played previously professionally also in Iran (Paykan, Saba, Petrochimi, Mahram and Foolad Mahan) and China (Monkey Kings). It may be one of last seasons in his extensive career, which he may end at Chemidor. Let's have closer look into Kamrani's outlook: An experienced PG, with court vision, passing skills and good defensive attitude. Can score if left open, has great leadership, he could also be effective at uppper level. are ready to play in Europe.